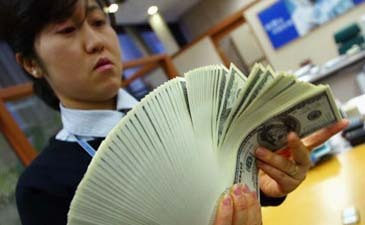 Inflation, weak demand dog Korean economy. Despite easing oil prices, the South Korean economy still faces high inflation and slackening domestic demand, a government report said on Sept. 4, stressing the need to create more jobs and secure a fresh growth engine. "Our economy is undergoing a downturn in domestic demand, and despite the recent drop in international crude prices, inflation woes are still present," the Finance Ministry said in its monthly report analyzing economic trends. "Top priority should be placed on stabilizing the livelihoods of ordinary people who suffer from rising prices. At the same time, efforts should be made to create jobs and boost the growth potential," it added. The estimate comes as South Korea is gripped by growing fears that its economy might face a crisis similar to the one it suffered a decade ago, as massive amounts of foreign capital could flee the local bond market this month. Government policymakers and other private experts rushed to dismiss the "September financial crisis" rumors, saying that South Korea has foreign reserves enough to pay out the nation's short-term debts. But the recent financial market fluctuations seen in the stock market and the sliding local currency are feeding fears that Korea's economy might be hit by the largest crisis since the 1997-98 financial meltdown. At a time when the global economy is fast cooling down, the government is pushing to boost domestic demand, which accounted for some 40 percent of the nation's gross domestic product. Earlier this week, the Finance Ministry unveiled a set of tax reforms including sharp cuts on incomes, corporate earnings and capital gains from property transactions. The move is part of an effort to stimulate sluggish private consumption and corporate investment, officials said. The ministry said that private-sector consumption declined 0.1 percent in the second quarter of this year from three months earlier, marking the first drop in four years. Consumer confidence fell to the lowest level in almost eight years in July. Corporate investment also remained weak. In the second quarter, corporate spending on facilities grew a mere 0.8 percent on-year, compared with a 1.4 percent gain during the first quarter. The job market has also slumped, with the number of jobs created in July standing at 153,000 from a year earlier. Exports remained the single bright spot for the local economy. South Korea exported a total of $37.39 billion worth of products in August, up 20.6 percent from a year earlier.